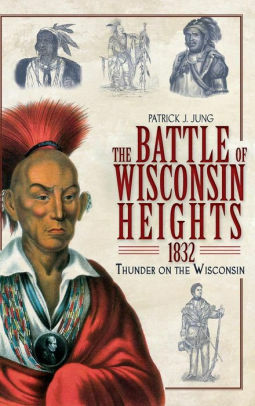 Author, Patrick Jung, will give a short presentation in the middle school Step Room, before boarding the bus to the DNR Blackhawk Unit, on the significance of the Battle of Wisconsin Heights, where Black Hawk and his warriors held back the militia volunteers long enough to allow his people to escape across the Wisconsin River. At the battlefield, which is listed on the National Register of Historic Places, Patrick will show participants where the militia took up their positions as well as where the warriors, under Black Hawk, fought. Maps will be provided. The trails that lead away from the parking lot/drop-off site at the battlegrounds are very hilly and unpaved. Participants must be able to walk about a half mile or so on this rugged terrain. Anyone who feels they might not be able to do it should not go, but are welcome to attend the short presentation at the middle school. Participants should be prepared for the weather with appropriate clothing, footwear and water. The buses are limited to 104 passengers. The parking lot at the Blackhawk Unit is not large enough for individuals to take their own vehicles. Participants wishing to attend should register for a spot on the bus and meet for the presentation at WHMS before boarding. Participants must register at either Black Earth Public Library (608-767-4905) or the Mazomanie Free Library (608-795-2104) until all spots are full and/or no later than Friday, September 14th.